Hi! Welcome to Block 3 of the Sew Let’s Quilt Along! Details of the quilt along are located on the Sew Lets QAL tab above, but here’s the short version: we’re presenting the blocks for this quilt along in segments. To win a prize, make all the blocks from that segment, then upload a photo of them all at the end of the segment. This is Block 3 of Segment 1. There will be five blocks in this segment, released every two weeks. The last block in Segment 1 will be released on May 7th; the Segment will end on May 20th. To enter for the Segment 1 Prize, you’ll have to have all five blocks finished by then. The prize for Segment 1 will be announced on May 21st. This week’s block is a quilter’s ruler. The designer of Block 3 is Sherry @ Powered by Quilting and you can download the pattern there. I’m not making all the blocks, but I am hosting and providing tips. Here’s my version of Sherry’s block from Electric Quilt. Here are my tips for making the Ruler block. This block has a lot of pieces, so to make it go together easily, I recommend taking care when cutting and sewing. First, you’ll make strip sets. With strip sets, you sew long strips of fabric together then subcut the strip set into smaller units that you’ll later sew into the block. Sherry has you make the strip sets wider than you’ll need to sub cut your units so you’ll be able to clean up the edge (just like you do with yardage) and subcut your units precisely. After starching your fabrics and cutting them using the Cutting Instructions on Page 1, sew them into the strip sets as instructed. For example, sew the 3-1/2” x 2-1/2” Black rectangle to the 3-1/2” x 2” rectangle and then to the 3-1/2” x 9” Black rectangle to create the Main Grid strip set. Press well, and measure that the strip set is 12-1/2” long. Resew it if needed. Turn the strip set vertically, and cut your first unit a little over 1” wide. Turn this unit around and cut the other side to make the unit exactly 1” wide. You now have a clean edge on the strip set. Sub cut the other two units at exactly 1”. Repeat this process to make all the strip sets. When assembling the block, be sure to pin the intersections when sewing the units together. Press well, then measure and trim your block to 12-1/2” square. To finish your block you’ll add applique numbers. I have a step by step photo tutorial on how to do raw edge fusible applique. To keep the raw edges from fraying, coat the back of your fabric with Fabric Mod Podge. Fabric Mod Podge makes the back of your fabrics kinda sticky, so you can probably skip the step where you press fusible to the back of your fabrics. You’ll still need to edge-stitch the pieces though to hold them in place. If you want, you can simply copy the numbers onto the fabric using a fabric pen such as a Pigma pen. Be sure to use a sandboard to stabilize the fabric so it doesn’t shift during the copy process. Thanks for the Tips! Where do I get the pattern? Drop by Sherry’s blog to download your free Mug block pattern. Hurry! The pattern is only available for free until September 21st. Here are the hosts for Segment 1. Drop by their blogs for tips on making the block. First, you must be 18 years old to enter. Now, unlike previous quilt alongs, this time you simply make the block. Then after the end of Segment 1, you need to post a photo of all blocks in that Segment to enter the giveaway. 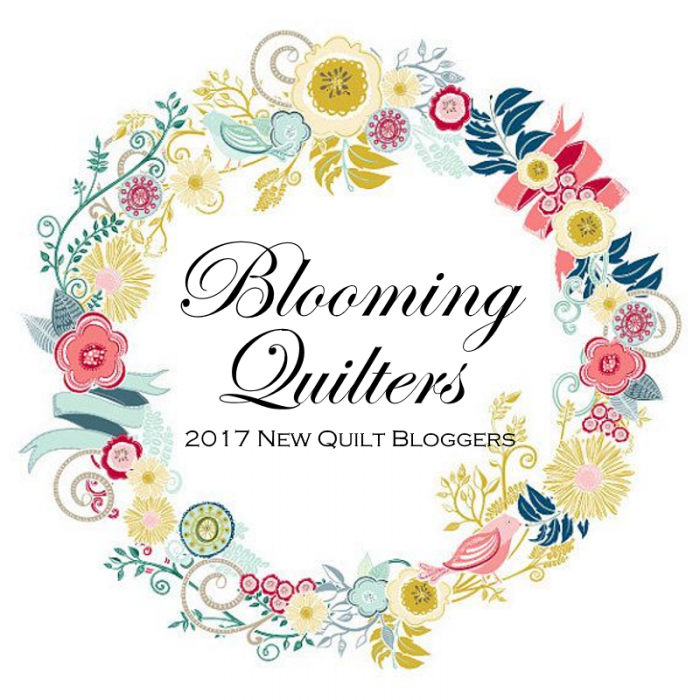 If you want to see the schedule for the quilt along and the list of block designers, click here. Remember, you don’t have to get the blocks done until it’s time to post a photo of all the blocks in Segment 1 and enter our Segment Prize giveaway. Personally though, I’d make the blocks when they come out so you don’t fall behind. Thanks for stopping by! The next block will be released April 23rd. Announcing a New Quilt Along from Partners in Design! Tell me…how are you planning on adding text to your block? Hi! Welcome to Block 2 of the Sew Let’s Quilt Along! This is Block 2 of Segment 1. There will be five blocks in this segment, released every two weeks. The last block in Segment 1 will be released on May 7th; the Segment will end on May 20th. To enter for the Segment 1 Prize, you’ll have to have all five blocks finished by then. The prize for Segment 1 will be announced on May 21st. This week’s block is a Mug. The designer of Block 2 is April @ JANDA Bend Quilts and you can download the pattern there. I’m not making all the blocks, but I am hosting and providing tips. Here’s my version of April’s block from Electric Quilt. Here are my tips for making the Sewing Machine block. This block uses a technique called Flip Corners to create the angles on the mug. With a flip corner, you draw a diagonal line, place the square on the corner of a larger piece RST, sew on the line, then flip the top piece back towards the corner, creating a right angle. To sew flip corners correctly, take the time to carefully mark the diagonal line on the back of the flip corner squares. I use a regular pencil, a small ruler, and my sandboard to do that. A sandboard really helps to prevent the square from slipping so you can mark the diagonally correctly. Then, instead of sewing right on the line you've drawn, sew just a bit to the right of it (closer to the corner) as you see here. Sewing the seam just a bit short of center makes a bit more room for the fold, so when you press the flip square back towards the corner it will fit perfectly. With flip corners, you typically trim the seam allowance after pressing the corner back.There are two schools of thought with this. If you don't trim, then you always have the bottom fabric (which is cut to size) to help you construct the block properly. If you do trim the seam allowance, you will have a lot less bulk in the seams. And you can always trim the finished unit to size (which I highly recommend if you do trim the seam allowance). You can embroider the text onto fabric, cut the fabric to size, and piece it into the block. You can copy the text onto fabric using fabric pens, cut the fabric to size and piece it into the block. You can print the text onto fabric, cut the fabric to size, and piece it into the block. Regardless of which method you choose for adding text to your mug, you’ll need to start by printing out Page 6 of the instructions. Make sure you select to print at 100%. After printing, measure the test block (the 1” square) to make sure you’ve printed the page correctly. To embroider the text, use an outline or stem stitch. First, lay the printout on your table and place your fabric on top and trace the text with a marking tool. I use my sandboard to keep the fabric in place while I trace the text. To keep the fabric from puckering too much from your embroidery, fuse a light weight fusible to the back. Then use the outline or stem stitch and three to six strands of floss to embroider the text. If you want, you can simply copy the text onto the fabric using a fabric pen such as a Pigma pen. Again, use a sandboard to stabilize the fabric so it doesn’t shift during the copy process. To print the text onto fabric instead, you’ll need printer-prepared fabric and an ink jet printer. For step by step instructions on how to print on fabric, click here. 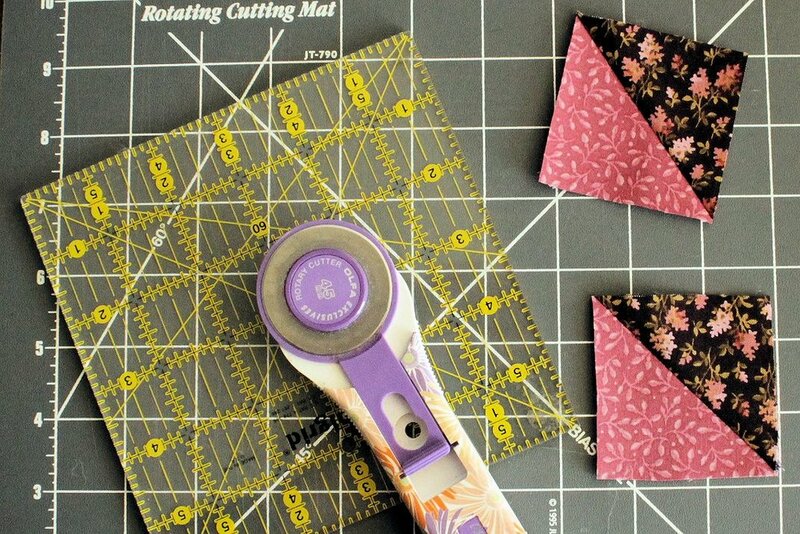 After printing, be sure to trim your fabric to 5-1/2” x 6-1/2” and piece it into the block. After you’ve sewn your block together, trim it to 12-1/2”. Drop by April’s blog to download your free Mug block pattern. Hurry! The pattern is only available for free until September 21st. Thanks for stopping by! The next block will be released April 9th. Hi! Welcome to Opening Day of the Sew Let’s Quilt Along! You’ll find the details of the quilt along on the Sew Lets QAL tab above. Here’s the short version: we’re presenting the blocks for this quilt along in segments. To win a prize, make all the blocks from that segment, then upload a photo of them to our Facebook group, Instagram with the hashtag #sewletsqal, or to a special linky we’ll host at the end of that segment. This is Block 1 of Segment 1. There will be five blocks in this segment, released every two weeks. The last block in Segment 1 will be released on May 7th; the Segment will end on May 20th, so to enter for the Segment Prize, you’ll have to have all five blocks finished by then. The prize for Segment 1 will be announced on May 21st. This week’s block is a Sewing Machine. The designer of Block 1 is Sandra @ Sandra Healy Designs and you can download the pattern there. Here’s my version of Sandra’s block. I picked my fabric choices for this block from my quilt along fabric pull. My thought was that I wanted something pretty for the sewing machine, but not so busy that you couldn’t tell what it was. So I choose a pretty tone on tone print. Next, I chose a coordinating “bee fabric” to act as the table. I chose a light grey for the panel and two coordinating solids for the large knob in the front. This block has a lot of pieces, so my first tip is to mark them. You’ll find a diagram on Page 5 of the pattern. Print it out because it’ll help you organize. Me, I like to clip my labels to my pieces using my Clover Mini Clips. This block uses a technique called Flip Corners to create the angles on the sewing machine. With a flip corner, you draw a diagonal line, place the square on the corner of a larger piece RST, sew on the line, then flip the top piece back towards the corner, creating a right angle. For this block, there are lots of tiny (1-1/4” and 1-3/4”) flip corners. With flip corners that tiny, I don’t bother trimming because I’d rather keep that under fabric that’s already cut to the right size so my units are correctly sized. So my tip is: don’t trim! Don’t forget to add the embroidery! This block includes a lot of cute embroidered details. Without them, your sewing machine block just won’t be as cute. Don’t let the fact that you don’t normally embroider stop you from adding these personal touches! First things first. Before adding the embroidery, fuse some light-weight interfacing on the back of your block, in the areas where the embroidery is going to be. This will stabilize the block and prevent it from distorting out of shape as you make your stitches. 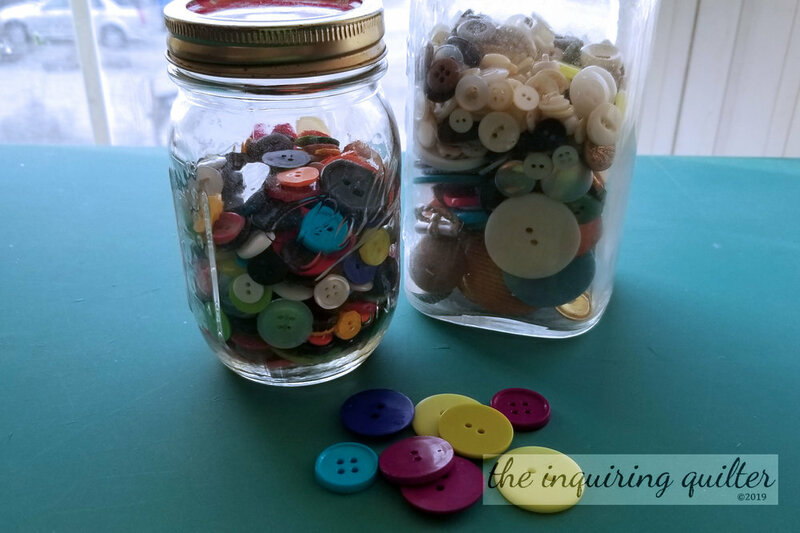 The first embroidery you need to add is the spool ends for the thread spools. To do that, you simply take one stitch at either end of the thread spool, using 10 strands of brown embroidery floss. To secure the thread, you can make a quilter’s knot. Click here to learn how. Next, you need to create the thread guide at the top of the sewing machine. To do that, take six single stitches close together in a parallel row. To create the needle, you use an outline or stem stitch. Click here to learn how. To create the thread that runs through the thread guides on top of the machine and also through the needle at the bottom of the machine, you can again use an outline or stem stitch, or you can mark the line with a marking tool, and stitching the line using your sewing machine. Me, I stitched it with my machine of course! <grin> My tip here is to use a thicker thread, such as 40 wt or 20 wt if you can. I ended up using Aurifil 50 wt. #2530 Blossom Pink because it matched my spool fabric perfectly! I think it turned out pretty good. To add the applique, start by printing out the templates on page 4. Use the 1” square to ensure they are the correct size. Print at 100% and DO NOT scale the pattern to fit. Next, trace the shapes on the back of your fusible web, fuse the web onto the back of your fabrics, cut them out, then fuse them in place. Edge stitch around the shapes to hold them in place and to finish the edge. If you’ve never machine appliqued before, click here for a step by step photo tutorial. For obvious reasons, you don’t want to add the buttons for the sewing machine until after the block is sewn into a project or quilt and you’ve finished it. Drop by Sandra’s blog to download your free Sewing Machine block pattern. Hurry! The pattern is only available for free until September 21st. Thanks for stopping by! The next block will be released March 26th. Tell me…Are you planning on making a quilt or a series of projects with your blocks from the quilt along? Today I’m excited to announce that in just two weeks the Partners in Design will be presenting a new mystery quilt along! In case you don’t know us, me and my Partners in Design have previously hosted a Christmas quilt along called the I Wish You a Merry Quilt Along and a fall themed quilt along called the Fall into Quilt Along. So what is the theme for our new quilt along? Sewing and Quilting of course! Excited? Man, I sure am. To make things even more exciting, we are changing things up this time so even if you’ve never done a quilt along before, you are absolutely going to want to do one now! So Who are the Partners in Design? Partners in Design is a group of quilt pattern designers who are working together to create a place for friends and fabric to meet up in creative fun. So How Is This Quilt Along Going to Work? First of all, there will be 13 blocks in this quilt along. Twelve blocks will finish at 12” square, and one larger block will finish at 18” x 24”. The quilt along will begin in two weeks, on Tuesday, March 12th at 12 AM EST, with the release of the first block pattern. A new block will be released every two weeks until we’re done. The difference with the quilt along this time is that the blocks are being released in segments, with prizes for participating being awarded after each segment. Like before, there will be hosts who will be quilting along with you, offering you their version of the block, along with pro-quilter tips and suggestions for making each block successfully. There will be a variety of techniques used, so by participating you’ll stretch your creativity and may even pick up a new trick or two. What if I Need Help on a Block? As before, the hosts will help with your blocks. If you need help constructing a block, we’re there for you. Each time a block is released, each of the hosts will post their personal tips and techniques for making the block. They will also share their fabric choices and personal touches. Talk about an idea factory! If you’ve got questions, you can post them in our Facebook group, day or night, and get an answer from one of our many hosts located around the globe or one of your fellow quilters. Wanna know if your fabric choices are good? Wanna check if that red piece goes on top of the blue piece or under it? Post a question and get an answer. Some of the hosts are planning on making quilts, so at the end of the quilt along, the Quilt Hosts will provide you with suggestions on how to lay out your blocks. With one block that’s 18” by 24”, you might place it in the center and arrange the other 12 blocks around it, with borders or sashing between them as you see fit. Or you might decide to place the larger block on the side instead of the center, and arrange the other blocks above, below, and to the side of it. The possibilities are endless and with our Quilt Hosts leading the way, you’ll get no end of inspiration for making a quilt using all 13 blocks. Planning on making projects instead of a quilt? No problem! Some of the hosts (including me) will be making projects right along with you! At the end of each segment, the Project Hosts will share their suggestions on how to use your blocks in a project or two! There are Prizes Too? Tell Me More! To be eligible for the Grand Prize at the end of the quilt along, you’ll need to sew all 13 blocks into a quilt top (the quilt does not have to be quilted), or use all 13 blocks in a project or projects such as a table runner, wall hanging, or tote. It doesn’t matter how many projects or what projects you make, or how many blocks you use in each project as long as you show that you’ve used all 13 blocks in a finished project or projects. Special note: To keep the contest portion of the quilt-along fair and fun for everyone, only quilters that use all of the designers' blocks (in a quilt or project(s)) will be eligible for the Grand Prize. Likewise, our Segment Prizes will only be open to those that make all of the designers’ blocks in that segment. Time to Thank Our Sponsors! Here are our generous sponsors, who are donating some really amazing prizes! In addition, many of my fellow designers (including me!) are donating our own patterns as prizes. So if you like prizes, this is the quilt along for you! Note: The prize giveaways are open to all participants, even international ones! However, you must be 18 years old to enter. I know you have a lot of things to do, and we value your time. If you quilt along with us, I promise you’ll have tons of fun, learn new things, make new friends and get inspired every day by your fellow quilters. The quilt along begins in two weeks, on Tuesday, March 12th and runs until September 24th. Here’s the schedule for the quilt along, the names of the designer for each block, and the date when each block will be released. Note: Block patterns will be released every two weeks at 12:00 AM on the date listed. Block patterns will be available for free from the designers until the date of the Grand Prize announcement. May 21st - Segment 1 Prize Winner Announced! July 16th - Segment 2 Prize Winner Announced! September 10th - Segment 3 Prize Winner Announced! September 24th - Grand Prize Winner Announced and last day to get the block patterns for free. This time, there will be some full-time hosts and some part-time hosts. Like before, you’ll visit the blog of the designer to get their block pattern when it’s released. Also like before, you’ll visit the hosts to see their version of the blocks and to get their tips for making it. There are three full-time hosts making projects. Visit any of them for inspiration on the types of projects you can make. In addition, there are part-time hosts for each segment. Visit them during their segment for inspiration and project suggestions. Making a quilt and not a series of projects? There are four full-time Quilt Hosts ready to provide setting suggestions for finishing your quilt. Visit them at the end of the quilt along for suggestions on how to set your blocks together. So What Do I Need to Do to Join the QAL? First, I’d gather your fabrics. Since the QAL is sewing and quilting themed, you may want to gather up your novelty fabrics. I’m making projects and not a quilt, so I am not worrying too much right now about all the fabrics going together. Instead, I’m looking for fabrics that speak to me. Here are a few. I also pulled a rainbow of solids I might use with my favorite fabrics. Because the quilt along is sewing themed, I pulled my sewing themed fabrics…. …and my bee fabrics too! Note: If you’re looking for yardages, we estimate that you’ll need about 2 yards for the block backgrounds, about 1/2 yard each of brown, black, and grey; and about 8 assorted prints and solids about 1 FQ or less each. After you’ve pulled your fabrics, be sure to drop by my blog every other Tuesday beginning March 12th. I won’t be hosting blocks, but I will be posting the information you’ll need to find that week’s block pattern. In addition, I’m planning on creating step-by-step photo tutorials to help you master the techniques needed to make each of the blocks. You’ll find the ways to follow me at the top of my sidebar. For example, you might sign up for my newsletter so you’ll get notified when a new block is released. Also, if you’re on Instagram, be sure to follow the #SewLetsQAL hashtag too, so you’ll see everyone’s photos! Finally, get your scissors sharpened, your sewing machine oiled, and your rotary cutter blade changed. Then rev up for a fun filled quilt along! The more people who participate, the more fun this quilt along will be. Remember, you don’t have to make a quilt to participate—you can make some smaller projects instead. So please invite your friends to our quilt along by posting our quilt along button to Facebook, Instagram, and elsewhere. Just right click this button and choose Save Picture As to save it. Then share it everywhere with a link to my special quilt along page so your friends can read all about it. Here’s a link to my quilt along page. Be sure to follow me so you can keep up with the quilt along schedule and where to go for each block. tell me…will you be joining us?